Wife. Mom. Blogger. Chocolate addict. I'm talking about my oldest son and you can't really spend a day with him unless I already know you and you are offering free baby sitting. But, trust me, he is hilarious. Griffin is not quite three and I'll be amazed if he makes it to elementary school without breaking a bone. I've mentioned several times that he runs around a lot. My brother says that he just runs until he hits something and that seems to be a pretty good assessment. I have entered rooms to find him on top of our pool table, hiding in the back of my closet, under the dining room table, under a pile of bedding creating a small giggling lump, and standing in his window sill hiding behind the blinds. This week he used an entire roll of scotch tape to create "reins" for a pair of horses (2 bar stools) that he was using to pull his carriage (kitchen chair). He uses a set of plastic keys to "start" his rocking moose (exactly like a rocking horse, but 50 bucks cheaper). He pretends to put on his fire hat, goggles, jacket, and helmet every time we get into our mini-van/fire engine. 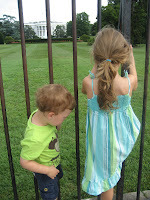 This is Griffin attempting to squeeze through the bars onto the White House lawn while encouraging his sister to do the same thing. He has very little respect for rules he does not understand. Which is most of them. 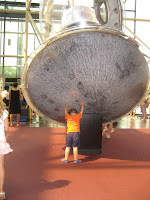 This is Griffin attempting to push over the command module from Apollo 11 at the National Air and Space Museum. He seems to think that he can do things like this. Jay: Do you need to go potty, buddy? Griffin: Nah, dat's just magic. I've heard it called a lot of things, but a magical wind that comes from your behind is a first. I love this kid. He yelled yee-haw when he saw videos of paratroopers invading on D-Day. He offers to fight bad guys he hears about from books/tv/adult conversations. He would love to be an astronaut/cowboy/fireman/football player. He also really loves to dance. I cannot wait to see what he becomes....unless he's in jail. That's always a possibility. 3 cities visited with three kids in tow. Philly, D.C, and Baltimore were great fun. We got to show the kids some American history, teach them more about how to travel, and sort of feel like we got to go on a real vacation again. 500 dollars over budget because we forgot how expensive it is to feed 5 people when you eat out every meal. Literally every meal. We got pretty creative about ordering three meals to divide by 5 people, buying milk every chance we got so we always had some for Baby Harry, and giving the kids watered down juice to drink. 123 minutes spent in the Hahnemann hospital ER in Philadelphia. Harry had a mild case of croup, but the ER was our only real option at that point. That's why I found myself walking along the streets of Philly at 5:58 AM carrying my baby to a hospital I've never seen. I shared the dawn with hospital staff on their way to work and the battered and bruised homeless population heading out the doors to face another scorching day in the sun. It did not help that the preserved historic facade looked like a place where blood might rush out of the elevators and deceased patients may pull your life support plug. 8 modes of transportation. We saw two airports and three train stations. We drove in cabs, buses, and vans. We took the Metro in DC and walked miles and miles both there and in Philly. Of all the things we did, I think our kids liked the subway the best because it involved tickets, gates, and poles to hold on to. Finally, we drove on home in our faithful minivan where Griffin fell asleep in 2 minutes. Really. He was asleep before we got to the gate to pay for parking. 100 degree weather for 4 straight days. We are from Atlanta and we know what hot feels like. I am used to sweat that trickles down the backs of my knees because just standing outside makes you sweat. I know what it is like to get so hot that you get the chills. It was that hot and we were outside in it with our sweet babies. We made sure everyone drank lots and lots and we went back to the hotel after lunch every day to cool off. My cheesesteak would probably have tasted better if I hadn't been sweating while eating it. 261 times we had to pick Griffin up off of the ground because he fell/found something shiny/wanted to crawl into a hiding place/just likes falling. He careened around our hotel room until he ran into the wall and gave himself a black eye. He crawled on the floor of our hotel rooms, the buses, and every museum we entered. Why does he do that? 2 reminders of why we don't go on guided tours. We heard a "man" who may have been a really good robot tell us about the assassination of Abraham Lincoln in Ford's Theater (while Griffin crawled around on the floor, naturally) and suffered through a description of the room where the Declaration of Independence and the Constitution were signed (while Griffin stood over an air conditioning vent giggling and yelling, "dat's COLD!"). We did not realize that either of these events involved listening to a park ranger or we would not have entered. You don't willingly take the bull into the china shop. 4 good friends who hosted us in their home in Baltimore. Kim (one of my college roommates) and her family picked us up from the train station, let us play with their toys, fed us Maryland crab cakes, and took us to the airport the next day. We got to tour their lovely town, chat with Kim's hilarious 3-year-old daughter (she has an imaginary deceased husband named Coco), and play some kind of dancing game on the Wii that I loved. I have been out of town for a while and I was in a horrible vortex where the wi-fi was reeeaaallly slow and my phone's apps wouldn't work. At least there was a Starbucks outpost in the resort. I was surrounded by teenagers because I was chaperoning a trip for our church and they couldn't fix it, either, so I know it wasn't my fault. Anyway, so instead of focusing on one moment, I thought I'd share a few of the single points in time of the last week that made me smile, laugh, and feel very grateful. "I know. Griffin said it was time to pick you up. His moose told him so." I don't know if I should be freaked out that the boy takes information from his rocking moose seriously, but at least it was accurate. Me: Look, a bunny is right over there! Charlotte: It's just like my purple bunny! Except that it's not purple and it's real. And it's a different size. Oh, a BUNNY! I love that the word bunny is all her stuffed animal and the real rabbit had in common, but for Charlotte it was a love connection. At Harry's 1-year-old birthday party, my dad asked my brother-in-law what he was actually doing all day. Since he's in training to be a Green Beret, this is not as rude of a question as it might seem. He (my brother-in-law) said that he was mostly in classes all day at this point, but that it "would be nice to finally get back out to working." You know, where people shoot at him. And other mean stuff. That's what he'd like to get back to doing. I am so grateful that good men stand in the gap for the rest of us in horrible situations here and abroad. And that they are really great uncles when they're in my home. Charlotte: I know how to get to Aunt Hellen's house, Daddy. Jay: Good, you can be my navigator. Griffin: She is NOT an alligator! YOU'RE an alligator! Way to defend your sister, Bud. Much as it frightens me, I have a feeling you might be one of those men in the gap when you get older. Harry took his first steps this afternoon. There were just a few of them, but they counted. What encouraged him to make that giant leap? Homemade ice cream on the 4th of July. How great is that? I am lucky and so grateful. The rewind of this busy week has been fun to watch over and over again. And how was my trip to the beach with no internet access? Pretty good. According to the Panama City Beach ABC affiliate, I participated in the world's largest single-site flash mob. Although, I highly doubt we set any kind of a record, it was great fun. Take a look at it below. 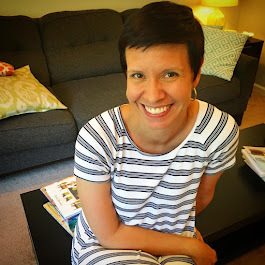 My name is Sally and I am a former history teacher turned stay-at-home mom to four beautiful children; an 11-year old daughter and three sons, ages 8, 6, and 4. I have been married to Jay, my very best friend, for 18 years and we live in Atlanta where I am usually blessedly warm. Put Me In The Zoo!